Police Commissioner GariBaki is concerned over the circulation of a video on social media and Facebook showing a woman being purportedly forced by police to chew and swallow condoms. Commissioner Baki is infuriated over this incident and is personally appealing to the victim to come forward and help internal investigators identify the person involved in this crime. The commissioner said although the footage does not show the perpetrator(s) it is almost certain that the crime was committed inside a police station going by the environment shown in the footage. The commissioner is also certain that the voice of the man forcing the victim to chew and swallow the condoms can be identified. He said if found the perpetrator will be dismissed from the constabulary and criminally charged and persecuted in the court of law. Mr. Baki said the constabulary has set procedures were such allegations or crimes perpetrators by police can be reported. He said such complaints can be registered with the Director of Internal Affairs P.O. Box 85, Konedobu or addressed directly to his office at the Police Headquarters. 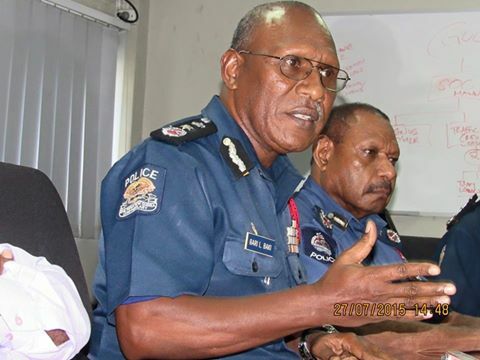 He added that the senior management of the constabulary is working around the clock to weed out corruption, police abuses and unethical behavior within the constabulary. “We will not tolerate such crimes, I appealed to members of the public affected by such crimes and abuses to report them to the constabulary’s public complaints section so that suspects can be dealt with both administrative and criminally. Policemen are not above the law and if they are found to have broken the law, they will be prosecuted just the same way as any ordinary citizen of this country.” Commissioner Baki said.